On this 9-hour tour, visit Niagara-on-the-Lake and Niagara Falls. 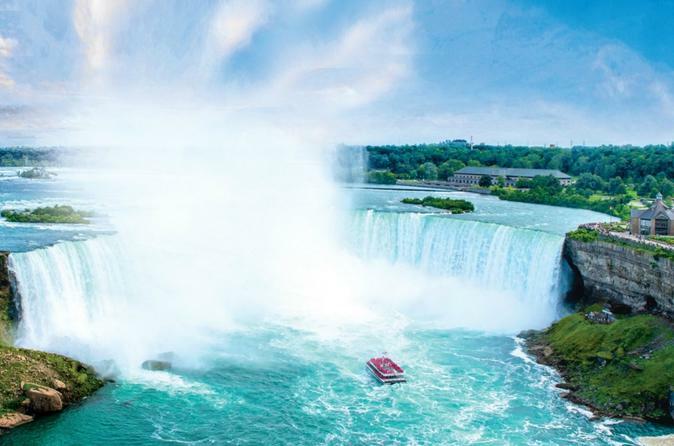 You'll journey around Lake Ontario, ride aboard the Hornblower Niagara Cruise, see amazing views of the Canadian Horseshoe Falls, and more. This tour has awe-inspiring views, optional activities, history, and beautiful natural splendor making this an activity with a little something for everyone. This tour is geared for travelers who prefer to have VIP line by-pass, door to door, and experience local hot spots. Embark on a once-in-a-lifetime journey into the mist of the falls. Hear the thunder of Niagara! After your up close and personal journey of the falls, you have free time to explore. Walk along the path to Table Rock to get to the closest view of the Canadian Horseshoe Falls. Then enjoy lunch over-looking the falls (not included), souvenir shopping, and an optional helicopter ride over the falls. You can even try the new zip line.